Hands up in the air during the Our Father? Topic: Hands up in the air during the Our Father? Re: Hands up in the air during the Our Father? Not odd at all. For those paying attention, it's a Middle Eastern/Oriental thing. Unless, of course, they're considered odd. Umm, when you are one or three in a parish doing it. It's odd. So just forget what your local church taught because ... everyone else is jumping off the bridge? I see. All you cultural anthropologists/ethnologists out there take note. Maybe you should stick to the important stuff like dating advice, sport. Donny, you are out of your element. Dude, the Orientals are not the issue here. When in Rome or in this case the Third Moscow. Ain't it just a Middle Eastern / Oriental thing. But, at an Antiochian parish (where I've seen it done many a time in many different parishes), it's not odd. Its also not odd that American converts would emulate the pious practices of those they worship with. And its not entirely odd when one is visiting a parish of a different jurisdiction if, instead of looking around to see what everyone else is doing, one does what they always do- from habit if from nothing else. Would that American Orthodoxy were more like the description of Orthodoxy given by an English Professor held by orthonorm in such low esteem- "Some stood, some knelt, some sat, some walked; one crawled about the floor like a caterpillar. And the beauty of it was that nobody took the slightest notice of what anyone else was doing." Another obscure reference from the uber-cool. We're all impressed, I just know it. Dude, the Orientals are not the issue here. Not even close to what I was saying. FormerReformer broke it down nicely, if you need help. Yes. We are praying to God, not hailing a cab. I can confirm that at the Antiochian Parish in the Kansas City metro that everybody does this. A healthy mix of ethnic/cradles and converts of various stripes. I've never seen it at another parish in the city, other than when they come around for the Pan-Orthodox stuff during Lent. I personally found it very moving when I first saw it and occasionally do it during my private prayers at home when I get to the Our Father, but forget about me trying to introduce it when none else is doing it. Then you're like the weirdos who refuse to sit in the pews when they visit churches where they sit during certain parts of the liturgy. It's just stupid and creepy to be intentionally defiant; I bear witness to these kind of Herman moments during the Pan-Orthodox services of Lent. Always someone in the middle of the church, who knows everyone else will sit, and waits for his moment to shine during the service. One would hope, during a Pan-Orthodox service, that at least there would be the excuse that there wasn't room to sit! Some people just have to be different, so they pray in strange ways. Interestingly, I don't see it among the local Arabs here, just the Converts. So, I also thought it was some strange innovation brought over from their Protestant mega-Church pasts. Glad to see that I may be wrong. But still, I am not going to do it. I like how the OO's pray. You don't see people swaying like in the Ethiopian Churches, do you? 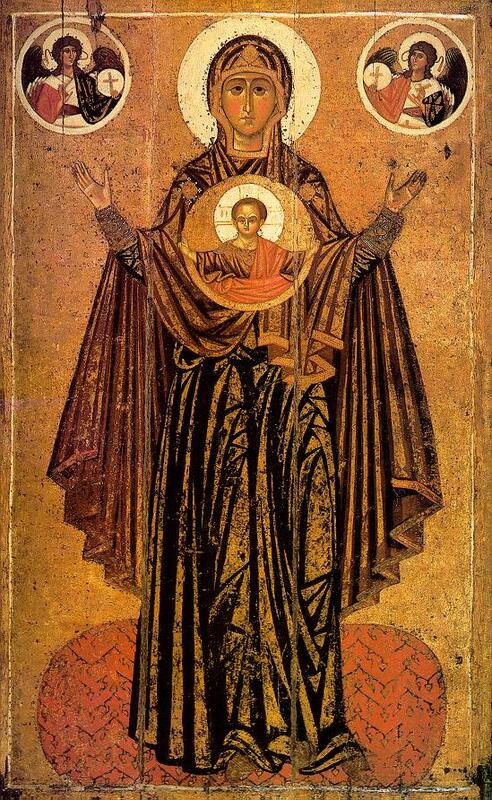 There is an icon in the background which shows a saint praying in the orans posture. A perfect complement to what the congregation is doing. When I lived in Istanbul, only the priest's wife did prostrations during Great Lent. I thought it odd that she would pray like the Muslims. So, when I saw other folks do prostrations in the United States (mainly in churches without pews), I realized how wrong I was; for all that I knew, the Muslims emulated earlier Orthodox practice and not the opposite. So, when I saw a Russian couple, Orthodox nuns and some converts elevate their hands, palm up, at the waist level during the Lord's Prayer, I thought to myself that it made sense and started doing it myself. If you think about it, it is a much more descriptive supplicatory gesture (especially at "Give us this day our daily bread") than the usual western one of hands joined together at the chest level. what faith are these guys? it looks like Islam with the rugs, the clothing, the beard, the way they line up, how close their hands are together as if they're holding a bowl. I have never seen an icon of St. Mina where he wasn't in that position. If it is good for St. Mina, what excuse do I have not to do it? But I'm not going to buy a camel. I'm sorry. I may live in the desert now, and be surrounded by Egyptians, but I have to draw the line somewhere. 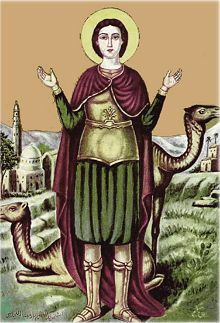 The more ancient icons of St Mina depict him as a soldier on horse, almost like St George. I saw this in an ancient Coptic Church once. The EOs depict him similarly. Oh, really? Maybe I saw one of those and thought it was someone else. Do you have a link to one of these ancient icons? I have only seen ones that look like the one you just showed in this thread. Oh, wait...and the "Christ and St. Mina" icon that is on the cover of my copy of Benedicta Ward's translation of the Sayings of the Desert Fathers (which I literally had right next to me when I wrote that other post; do'h). But he doesn't look like a soldier in that one, either. Hmm. These are muslims offering prayers during the hajj in Mecca (their clothes are Muslim pilgrimage garments). Your obsession with besting me is besting your ability to do that very thing. Go back to what I was referring to. When in Rome as always. With all due respect, Mina, it's possible that the *way* you do it is influenced by Protestants in Egypt. Or, given the way that it's how everyone else in the Middle East prays, it's how prayer is described in our Scriptures, depicted on our icons, and how our priests pray in Church, that it has nothing to do with Protestants. This entire discussion really points out one of the real world problems we face within Orthodoxy, particularly when we speak in hushed, reverential tones about the need for unity in America. One of the causes, if not THE cause of disunity - is the refusal of each group of ethnic Orthodox to either accept the legitimacy of local traditions at odds with what they have learned either as children or as converts. Frankly I think that we have to place some of the blame for this not on our yia-yias or babas or grandmothers, but rather on ourselves for being close minded and upon our hierarchs and clergy for not having the pastoral wisdom over the past century of the American experience in America to realize that cultural imperialism is not going to be the path to growth or unity here. I was personally unaware of the 'hands up' in the Arab tradition. However, it does seem to be a long standing and venerable pious custom of our Arab Christian brothers and sisters. Why debate this? Especially in such acerbic and 'knowing' tones that many like to use when espousing the validity of one pious expression over another or in purporting to demonstrate the impropriety of one over the other. I think that Second Chance's observations have a great deal of validity. We can learn much from our brothers and sisters and learn from the cultural context in which they worship. I've seen Jewish Women hold their hands in a similar position when they light Shabbat Candles. This is also common at my Antiochian parish. About half of the people do this, I would say, during the Our Father. Another thing I notice, slightly OT: in Antiochian parishes, especially ethnic Arab parishes, it seems common for some to say the prayer behind the ambon (O Lord who blesses those who bless thee...) in unison with the priest. Not aloud like the Creed, but kind of under their breath. I assume this is also something from the Old Country. Look at this Protestant, hanging out in the 2nd century catacombs in Rome. It's disgraceful! Another early Protestant, St. Agnes. Thank goodness we don't have such people around us today, Protestanting up our churches with their examples of martyrdom and improper limb arrangement. Not you too, Theotokos! Is there no one these Protestants can't get to with their Protestantly Protestant Protestantizing influences?! Hey, St. Apollinaris of Ravenna! Put down the "Left Behind" books I know you're hiding somewhere in your robes and get back to tending those sheep! They're looking at you because they're disgusted by your clearly heretical posture. Is Christ really blessing Alexander Nevskiy? Lord, can't you see that he's imitating the Protestants?! Not the act of holding hands in the air itself. There is a difference between the Orans and droopy protestant invisible fish-holding hands. In the back right of mina's pic, some guys are actually doing the orans. Apparently your holy EO bodies must work differently than ours, since we're so influenced by Protestants. ^Do you have any evidence for your claim? Not really, it's more of an anecdotal observation than a claim. Would it really be so horrible if the prot style of hand raising, of all things, was used a bit in the church? They have to hold fish, since they abandoned the Cross. Ah, thank you. I didn't think they were the same (as that one doesn't look like the others), but the book jacket photo credit just says "St. Mina", and, well...you know...Coptic Orthodox...so many Minas! And Greek, Menas. And both have the nasty habit of dropping the s.
Maybe Egypt needs the Coptic version of The Cosby Show. The Coptic Show. Oh dear. Be careful what you wish for...you say that around the wrong people, you end up with things like this and this. Menas in Greek, but Mina in Coptic and Arabic. It's all the same. The Greek and Coptic are spelled exactly the same MHNA. The "s" at the end is simply an indicator of the nominative case. H is normally transliterated as 'e' in English, while spelling it with an 'i' reflects current Greek/Coptic pronunciation. No difference. You've got to love Orthodox forums. Heck, we should label everyone we don't like as devil-worshippers. Get thee behind me papist! I've heard good things about Armenian Idol. - Who Wants to Be a Welder? It seems as if my comments in reply #69 have been validated by the continued nature of the comments here. I can't imagine that many Bishops will have the wisdom to guide a diocese based on geography which contains a plethora of varied ethnic traditions without gradually (or worse yet, quickly) imposing the ones he was raised in or adopted. The chaos that will ensue may very well destroy many congregations if the intolerance displayed here is any indicator.